Only one member of the Wisconsin Badgers , Joe Thomas, went in this weekend&apos;s NFL Draft. Others will be looking to hook on as free agents. 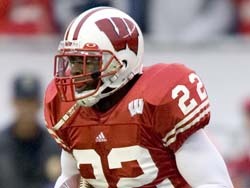 UW safety Roderick Rogers (pictured), has agreed to a free agent contract with the Denver Broncos. The Broncos are expected to play Rogers at safety but could possibly move him to cornerback later. Fellow Badger Mark Zalewski has also agreed to a free agent deal with the New York Jets.